Maintaining a saltwater tank is more than just a hobby – it is an opportunity to learn about and cultivate a variety of unique and fascinating creatures. The seahorse is just one of many saltwater creatures that has fascinated mankind for ages. These delicate creatures are incredibly unique and, sadly, endangered. Though some mistakenly believe the aquarium trade has led to a decline in wild seahorse populations, it has actually been contributing to their survival. The major reason for the decline of these creatures in the wild is habitat destruction – captive breeding may soon be the only way to perpetuate the species. If you are looking for an interesting species to stock your tank, think about adding a few seahorses. The seahorse is a marine fish belonging to the genus Hippocampus in the Sygnathid family. There are roughly 35 to 40 recognized species of seahorse in existence and they are unique from most saltwater species. Unlike many saltwater fish, seahorses swim upright, using their dorsal and pectoral fins to propel them through the water. These creatures do not have scales but a series of plates that form a sort of bony armor to protect their delicate bodies. Seahorses are named for their oblong, horse-like heads and they are also easily identified by their bent necks and long snouts which they use to seek prey from tiny cracks and crevices. In the wild, seahorses can be found in a variety of habitats from shallow reefs to sandy grass beds, even among giant clumps of seaweed. In the home aquarium, however, these creatures have similar requirements to other saltwater fish. Though there are over 35 species of seahorses that have been recognized, only a few of them are recommended for keeping in the home aquarium. While some species remain very small, rarely growing larger than 1 or 2 inches tall, some species like the Giant seahorses can reach lengths in excess of 12 inches. Dwarf seahorses grow to a maximum of 2 inches and may vary in coloration from black or white to tan and yellow. This species is fairly difficult to keep and it does best in a species-only tank with 4 or more of its own kind. Black seahorses are somewhat larger, growing up to 6 inches long, and they are moderately difficult to care for. This species is one of the hardiest and most energetic of the seahorse species and it is notorious for its ability to hide. The Kuda, or Estuary, seahorse is also moderately difficult to keep and it can be identified by its gold coloration with a dark band running down its back. These seahorses do best in species-only tanks, though they do tend to get along with pipefish. The most important thing to keep in mind about seahorses is that they are incredibly sensitive to changes in water chemistry. To keep seahorses in the home aquarium it is essential that you maintain a stable water temperature between 76 and 78F (depending on the species) and that you provide excellent filtration to keep water quality in the tank high. Seahorses generally prefer a turbulence-free tank so your aquarium filter should not produce any air bubbles or a high rate of flow – these creatures can actually develop a condition called Gas Bubble Disease if exposed to too many air bubbles. Another important thing to consider is that, due to their upright stature, seahorses prefer a tall tank to a wide one. These fish require plenty of vertical space, particularly when it comes time for mating. Unfortunately, there are very few species of fish which can be safely kept with seahorses. 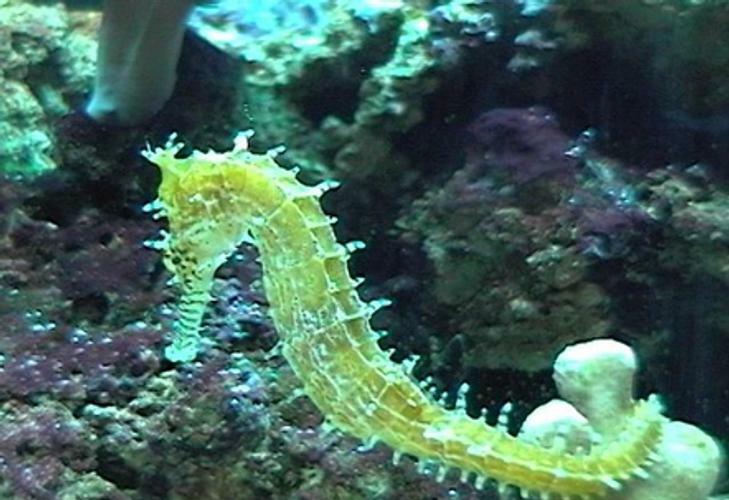 If you want to cultivate seahorses, it may need to be a dedicated seahorse tank. Be careful about mixing different species of seahorse because not all of them are compatible. Nutrition is also a significant concern when keeping seahorses in captivity, especially with wild-caught specimens. Tank-bred seahorses will generally accept frozen food and live foods should only be used occasionally. To provide seahorses with adequate nutrition, it is wise to choose frozen foods that are enriched with vitamin supplements or to add the supplements yourself before feeding it to your seahorses. If you do plenty of research before setting up and stocking your seahorse tank, you should have little trouble cultivating these beautiful creatures.